Newt Gingrich has a message for Republicans: Stop being so negative, and start talking about ideas – including alternatives to President Barack Obama's health care overhaul. 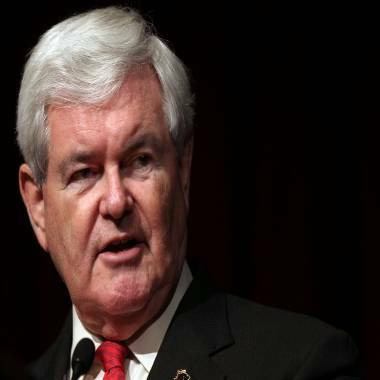 Former Republican House Speaker Newt Gingrich discusses a possible presidential run for Hillary Clinton in 2016 and who may be able to represent the GOP. Speaking at the Republican National Committee's annual summer meeting, the former House speaker and presidential candidate told Republicans that “hope” should be a key part of the party’s messaging. "I think part of what we need to do in the era of Obama's disaster is we have to get beyond being anti-Obama and we have to re-convince people that we can have hope in America, that we can have a better future," he said. The comments came during a working lunch with RNC Chairman Reince Priebus titled "Becoming the Party of Breakout," a term Gingrich uses in the title of an upcoming book about his vision for the future of America. Gingrich said that Republicans should use town hall meetings in their districts to discuss local issues with entrepreneurs and industry innovators in an effort to show that they have new ideas for the future, and not just a frustration with Obama's policies. "Imagine you went in to the poorest neighborhoods in your state, and you began to talk about the things that need to be fixed in a positive way and how are we going to fix them, and you give people a choice between hope and despair," Gingrich said. The former House speaker offered support for the man who now holds the job, saying John Boehner did the right thing by focusing on the stagnant job market as a focal point of his criticism of the president. But Gingrich added that the Republican strategy toward the Affordable Care Act is too negative. Republican presidential candidate, former Speaker of the House Newt Gingrich speaks at the 2012 New York Republican State Dinner on April 19, 2012 in New York City. "We need to build a new model, a Republican answer, which starts with the health system we need and that's why I'm against Obamacare, in that order," Gingrich said, "But we need to get away from this, you know, you say 'I'm against Obamacare' and then stop because you think that's all you have to say." Gingrich believes this strategy could help on the national level, particularly against potential Democratic nominee Hillary Clinton in 2016, but he conceded that if the race is simply "a personality fight," that Clinton would win. "I don't think we beat Hillary Clinton in a personality fight because the news media will prop her up," Gingrich said, "I don't think she can win a fight if she has to be defending the prison guards of the past and we get to be offering the pioneers of the future. If she has to defend the current failures and we have to offer a dramatically better future, I don't think she can win that campaign." Republicans are meeting for three days in Boston to discuss the party’s strategy, as well as housekeeping issues like rules and their budget. The summer meeting will culminate with a general session during which they will hold votes on issues such as whether or not to boycott NBC News and CNN from GOP primary debates if the networks broadcast long-form programs about Hillary Clinton.